[SatNews] LizardTech® has launched GeoGofer, a software solution for finding geospatial imagery quickly and efficiently, regardless of where that imagery may be located. 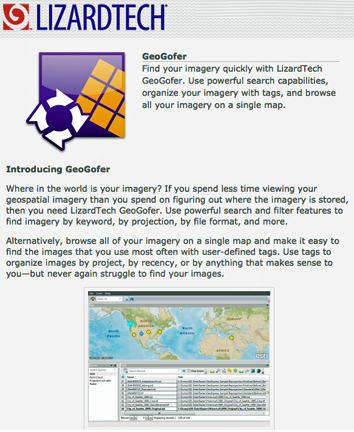 GeoGofer was designed to streamline the process of finding, organizing, and tracking geospatial imagery. To that end, GeoGofer comes with powerful search and filter features that can be used to find imagery by keyword, by projection, by file format and more. With GeoGofer, users can browse all of their imagery on a single map, tag images for later use, and perform powerful queries using simple tools. Users can search by modification date, by number of bands, or by resolution to find the imagery they need—when they need it. GeoGofer integrates fully with trusted Esri technology and uses an existing ArcGIS Online subscription to store and query image information. Additionally, if users have ArcMap installed on the same machine that runs GeoGofer, they can open images directly in ArcMap.